Pop rock strikes big with the formation of guitar-based boy bands Busted (2002) and McFly (2003). Busted landed their first cover of Smash Hits with the headline: "Meet Busted: They're Going to Be Bigger than Rik Waller! ", making them the first pop band to appear on the magazine's cover before releasing a single. In another first, McFly became the youngest band ever to have an album debut at number one—a title taken from The Beatles. In 2005 Take That triggered the start of something with their comeback, scoring a string of chart hits across the UK and Europe while taking the number of records sold to 45 million worldwide. Their shining example was followed by comebacks from 5ive, Boyzone and 1984’s boy band pioneers New Kids on the Block, leading to huge waves of nostalgia. A new craze for TV talent shows saw the birth of some colossal boy bands. In 2008, X Factor runners up JLS received massive support for their music, with their first 2 singles hitting number 1. This was followed soon after by a number 1 album and a flurry of Brit and MOBO Awards. They’ve now sold more than 10 million records worldwide. X Factor 2010 runners up One Direction used social media to propel themselves to international success. Their 3 albums broke several records, topped the charts of most major markets, and generated a bunch of hit singles. One Direction became the first band in US Billboard 200 history to have their first three albums debut at number 1, also achieving the fastest and biggest selling album of 2013 in the UK. 2010 saw something incredible happen. Boy band giants New Kids on the Block and Backstreet Boys combined forces to create the colossal supergroup NKOTBSB. The two different generations came together to tour North America, Europe, Australia and Asia, a combination that proved impossible to resist for fans. Fans of McFly and Busted have been in a frenzy since they announced their unification as supergroup McBusted. Between them, they have an arsenal of hits and some impressive musical accolades - 14 Combined number 1 records, 20 Combined top 3 singles, 28 Combined top 10 singles, 15 MILLION combined record sales & 3 combined Brit Awards. The resurgence of our favourite boy bands brings with it opportunities we never thought we’d get to enjoy. You can catch Backstreet Boys, McBusted and 5ive THIS YEAR! Backstreet Boys March/April Tour – Birmingham, London, Glasgow and Manchester – click HERE for details. 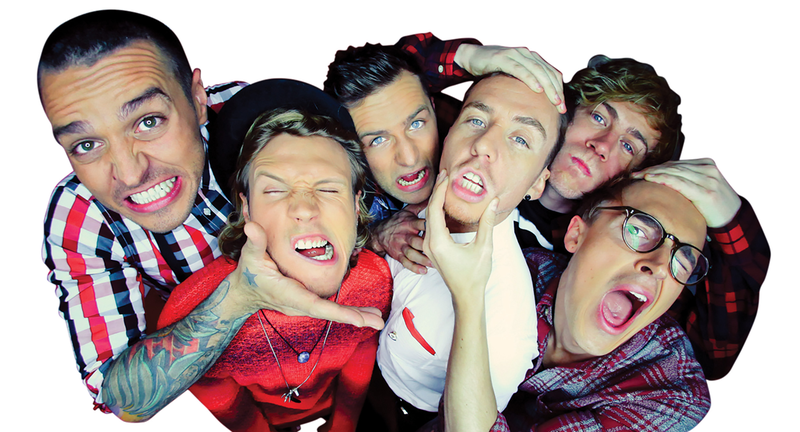 McBusted team up with Backstreet Boys and 5ive – Weston-super-Mare/Ipwich – click HERE for details.